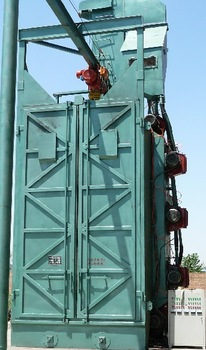 Product categories of Shot Blasting Machine, we are specialized manufacturers from China, Shot Blasting Machine, Spinning Hang Sand Blasting Machine suppliers/factory, wholesale high-quality products of Hanger Hook Sand Blasting Machine R & D and manufacturing, we have the perfect after-sales service and technical support. Look forward to your cooperation! Shot blasting machine is used for cleaning or reinforcing various small , medium and large batch forged spares, casting and sheet metal spares parts . 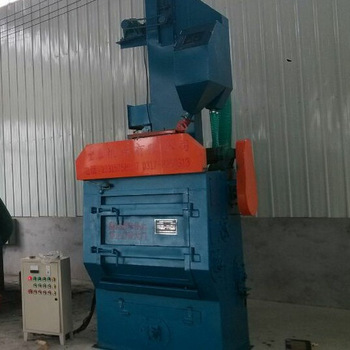 Shot blasting machine has two type : Tumble Belt Type Shot Blasting Machine and Hook Type Shot Blasting Machine according to the size of the work piece .